You’ve probably heard someone say that Indian tribes pay no taxes. Wrong! It’s true that reservation lands held in trust by the federal government are exempt from state or local taxes. But that’s not the whole story. The Coquille Tribe believes in paying its fair share for local government services such as police and fire protection. One way we do that is a Payment in Lieu of Taxes (PILOT) agreement. Basically, the Tribe negotiates a fair price with local authorities, and the subsequent payments take the place of property taxes. In North Bend, where we operate The Mill Casino-Hotel and RV Park, we’ve made PILOT payments for decades. No other property owner pays as much to North Bend as the Tribe does. In fact, our current payments are nearly five times what North Bend receives from the next largest property owner, Pony Village Mall. In addition to our North Bend PILOT, we pay the Charleston Fire District to protect our Kilkich Reservation. We also voluntarily contribute hotel room taxes to help support tourism promotion in the Coos Bay area. And, of course, we pay regular payroll taxes and government fees like any other business. One more thing: Not all tribal land is exempt from property taxes. Only the reservation lands held in trust by the federal government have the exemption. Other property the Coquille Tribe owns, including some forest, farm and commercial property, are subject to the same state and local taxes as any other real estate. The Coquille Indian Tribe definitely pays its fair share. We’re proud to help support public services in all the communities where we live and do business. 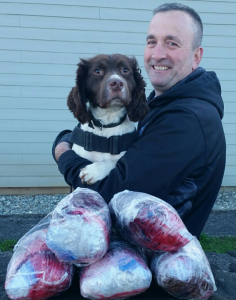 Officer Rob Scoville and K9 Ben celebrate a successful search for illegal narcotics. When police departments in Coos County converge for a drug bust or major crime investigation, Coquille Tribal officers are likely to be on the scene. As sworn officers empowered to enforce Oregon laws, Tribal police routinely partner with the Coos County Sheriff’s Office, city police forces, and the Oregon State Police. They work to protect not only Tribal members, but the entire community. Our two drug dogs, Ben and Stormy, often figure prominently in local narcotics cases. Founded in 1996, the Coquille Tribal Police Department has three officers and a chief of police. Tribal officers protect the Kilkich Reservation near Charleston and the 5,900-acre Coquille Tribal Forest. Tribal officers refer Tribal-related cases to the Tribal Court. They also enforce the Tribe’s Civil Code. All Coquille Tribal police complete Oregon’s police academy to be certified as officers. They’re empowered to make traffic stops and enforce state law wherever their help is needed. The Tribal police headquarters serves as a substation for the Coos County Sheriff’s Office. The department is an active member of the South Coast Interagency Narcotics Team (SCINT), the regional anti-drug coalition. 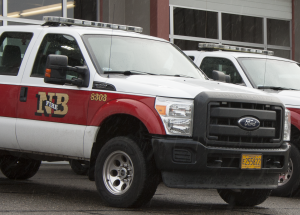 Because Indian tribes often have access to special grant funding, the Coquille Tribe has partnered with neighboring agencies to help them buy vehicles and equipment. Though small, the Coquille Indian Tribe’s library contains extensive information on southwest Oregon tribes, as well as general-interest materials about the region. Many of its materials are available for public use. The library’s collection focuses on information from the perspective of Tribes and Native Americans, such as Tribal histories, traditional technologies, traditional languages, health, education, law, and other culture-related subjects. The collection also contains general-interest materials, similar to what might be found in a small public library. More than 3,000 books available for loan. Newspapers published by Oregon tribes, local southwest Oregon community newspapers, and major Oregon newspapers. Archival documents from the Melville Jacobs Collection, Southwest Oregon Research Project, and other archival resources. 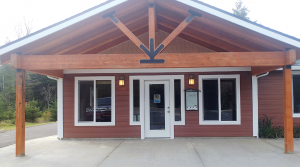 The CIT Library is at 495 Miluk Drive, Coos Bay, Ore. It is located inside the Tribe’s Culture, Education and Learning Services building, near the entrance to the Tribe’s reservation lands off Cape Arago Highway, north of Charleston. Click here for map. Operating hours are 8 a.m. to 5 p.m. Monday-Friday.